There’s seldom a wrong time for a molten chocolate pudding. But being in the middle of winter makes it all the more welcome. Winter warmers are the ultimate comfort food. The colder the day, the sweeter the moment. 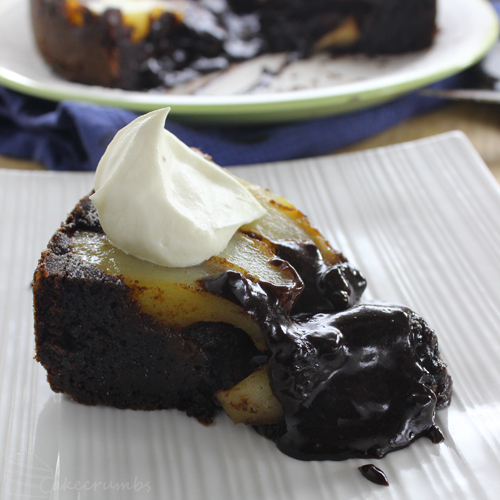 This molten pudding is combined with one of my favourite fruits: pears. 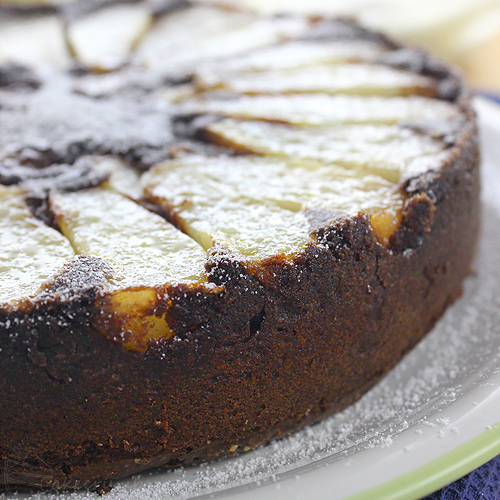 There’s so many varieties available in the fruit shop at the moment, but this is made with the common Packham pear. You can use most any variety available to you as this recipe doesn’t demand a particular flavour profile — chocolate goes with everything! You can use any pudding or cake dish to make this recipe. You can arrange the pears as I did, or just throw them in for a more rustic look. 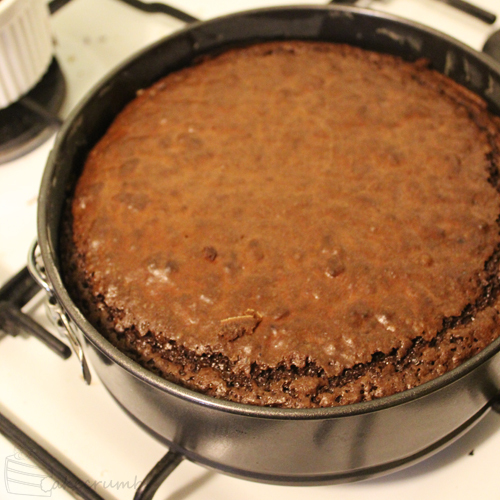 Pour the chocolate batter on top and bake and you’ll be greeted with this unassuming-looking cake. Until you turn it over that is. Dust it with icing sugar for a little colour or leave as is. 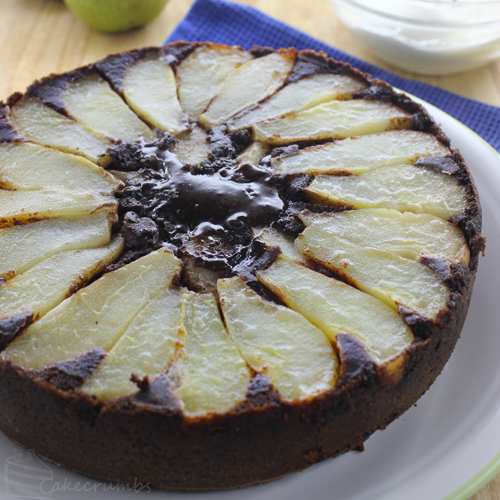 It’s a dessert that’s lends itself equally well to taking care or not bothering. Once you take the first slice the lava comes oozing out. How long you cook it for will determine how oozy it is. If you like a lot of sauce, cook it towards the lower end of the time allowance. Served with cream, ice cream or just eaten alone it’s a decadent dessert the delivers on all fronts: a crispy exterior, a moist chocolatey cake and the warm chocolate sauce to top it off. This dessert is best eaten right after it comes out of the oven, but it tastes almost as nice the next day eaten either at room temperature or reheated for 30 seconds in the microwave. Verjuice is an unfermented grape juice. If you can’t find , you can substitute it with white wine for a boozy hit, or a lemon juice and water mixture if you’d prefer to stay alcohol free. Preheat oven to 180°C (160°C fan-forced/350°F). Lightly grease an approx 21cm baking dish or cake tin. Combine the verjuice, caster sugar and pears in a medium saucepan. 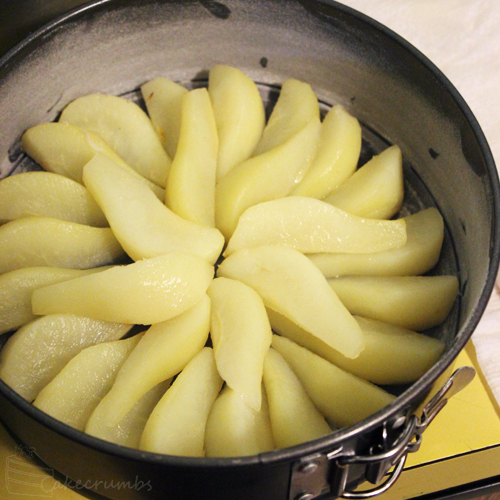 Simmer for 10 minutes, or until pears are cooked through. Drain the pears and leave to cool. Melt chocolate and butter in a heatproof bowl placed over a pot of simmering water, stirring continuously. Set aside to cool. Beat eggs, egg yolks and brown sugar until thick and pale. Stir in the chocolate mixture, then fold in the flour and cocoa. 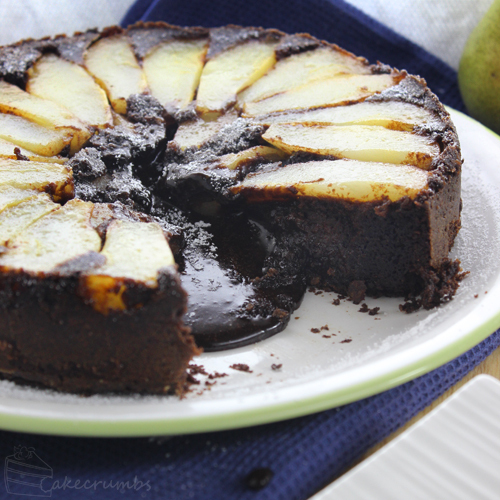 Place the pears into your baking dish, then cover with chocolate cake batter. Bake for 1 to 1.5 hours (pending on how molten you want your centre to be). Pudding should come away from the sides of the dish, but still be gooey in the centre. Allow to cool in the baking dish for a few minutes, then careful invert onto a serving platter. 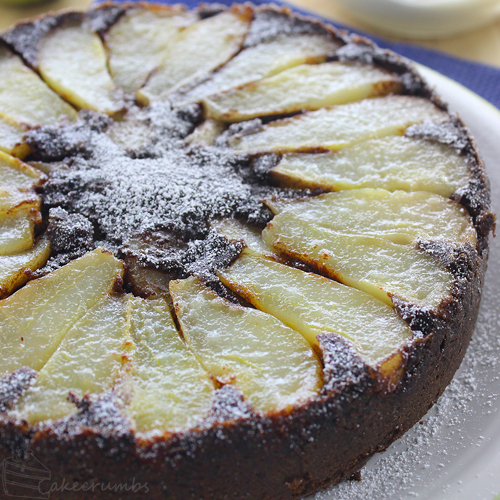 Serve warm, dusted with icing sugar and accompanied with whipped cream or ice cream if desired. This looks so absolutely amazing! I can’t wait to try it out! The oozy centre was irresistible. I can’t decide if I liked it better hot, or later one when it had set a bit more – great both ways! What is verjuice? really want to make this now! From the post: Verjuice is an unfermented grape juice. If you can’t find it, you can substitute it with white wine for a boozy hit, or a lemon juice and water mixture if you’d prefer to stay alcohol free. What type of dark chocolate do you use? Bittersweet, semisweet or other? Feel free to use whichever is to your personal taste. Thank you. Another question is are there any steps that can get prepared the day before serving either by placing in the refrigerator or at room temperature without affecting the gooiness of the pudding or the final outcome? I occasionally make up large batches of puddings and put them in the freezer, defrosting on the afternoon the are required. There’s likely to be some textural differences but nothing significant. It’s always best prepared at room temp and placed immediately in the oven, but sometimes occasions don’t allow for the time and shortcuts are a must. If your concern is for how gooey it will be, either bake it from room temperature or just keep a close watch on it during baking.